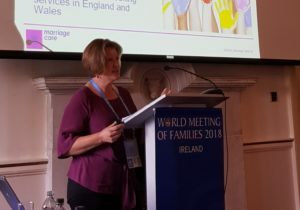 When I was asked to represent our volunteers at the World Meeting of Families in Dublin, I have to admit to feeling extremely excited as well as slightly bewildered. Why me of all our 665 volunteers? I returned from Dublin exhausted, exhilarated and very clear as to why it was so important that a volunteer was part of our Marriage Care team. Although there was much excitement over the larger events such as running the reception with our friends from the Relationship Alliance, speaking as a panellist with Elizabeth at the Pastoral Congress, the Festival of Families at Croke Park and the Papal Mass, it was the smaller things that were more special to me personally, particularly the wonderful people we met. During the first half of our stay we manned our stall at the Pastoral Congress. This gave us the opportunity to talk to people from all around the world and share with them our work. In many cases Marriage and Family ministry was very much in its infancy and there was a great deal of interest in the resources we use; it made me appreciate just how fortunate we are. I also got the sense that the small amount I do in Oxford and we all do across the country as Marriage Care volunteers is part of something so much larger within the Church. Of course a highlight for us all was the Papal Mass and in our case the significance of this was made far more poignant by the company of an elderly lady who had experienced extreme difficulties within her Marriage but retained a deep faith and trust in God. So all in all a week that was all about families was also one that highlighted our being part of a wonderful team and in the privileged position to be able touch people’s lives at times of great joy and great difficulty. We are truly blessed! The photo shows Fran speaking at the World Meeting of Families. Fran and Elizabeth Davies, our Director of Marriage Preparation and Formation, did a presentation on Lay Leadership in the Church.